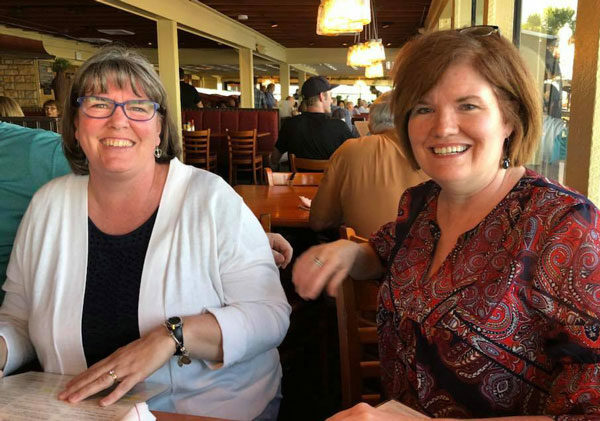 Attendees of the April 16-19 summit in Daytona Beach, Fla.
Lisa Fetters (right) with Janet Bolich, from Prince Street UB church (Shippensburg, Pa.). 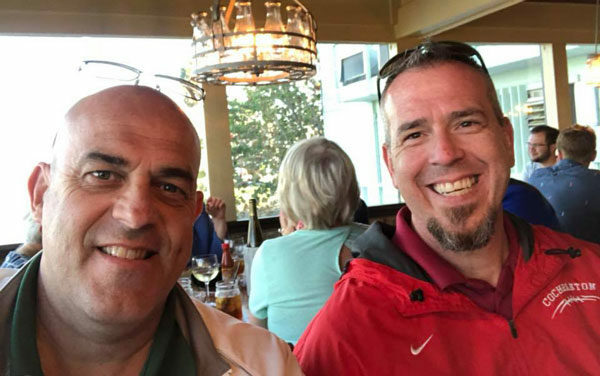 Bishop Todd Fetters (left) with Marc Stephenson, pastor of Mt. Olivet UB church (Chambersburg, Pa.). Every other year–the year when we don’t have National Conference–we hold Pastors Summits for senior pastors and spouses. Three such summits are happening during April. All are being held in Daytona Beach, Fla., starting on a Monday and ending on Thursday. The first summit was held April 9-12. It was for senior pastors and spouses from churches with an attendance above 300. 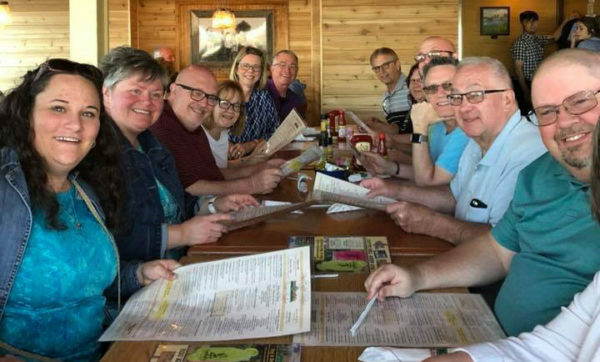 Nine pastoral couples attended, along with Bishop Todd and Lisa Fetters, National Ministries director Mike Dittman, and UB Global associate director Frank Y. The second summit is ending today. It is for senior pastors and spouses from churches with an attendance of 150-300. The attendees include nine pastoral couples, three senior pastors by themselves, plus Bishop Todd and Lisa Fetters and Mike Dittman. The third Pastors Summit will be held April 30 – May 3. This one is for senior pastors and spouses from churches with an attendance below 150. This will be the largest group. There will be 22 pastoral couples, plus six senior pastors attending by themselves. Todd and Lisa Fetters and Mike and Pam Dittman will also attend. Children’s presentation on Easter Sunday at First UB. 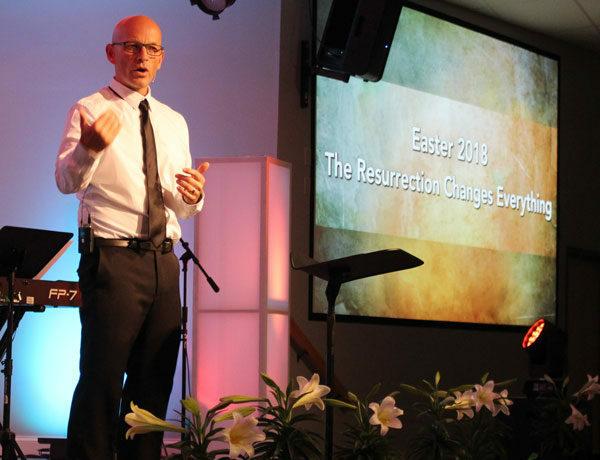 First UB celebrated Good Friday with three separate services. 8:30 am: Totally Alone. Remembering the people who left Jesus to the authorities, and the forgiveness of Jesus towards those who left him behind. Noon: Totally Abandoned. Remembering the dimming of the sun as the Father turned away from Jesus. We had a gradually dimming sanctuary eventually illuminated by only a small spotlight in the middle of the cross. 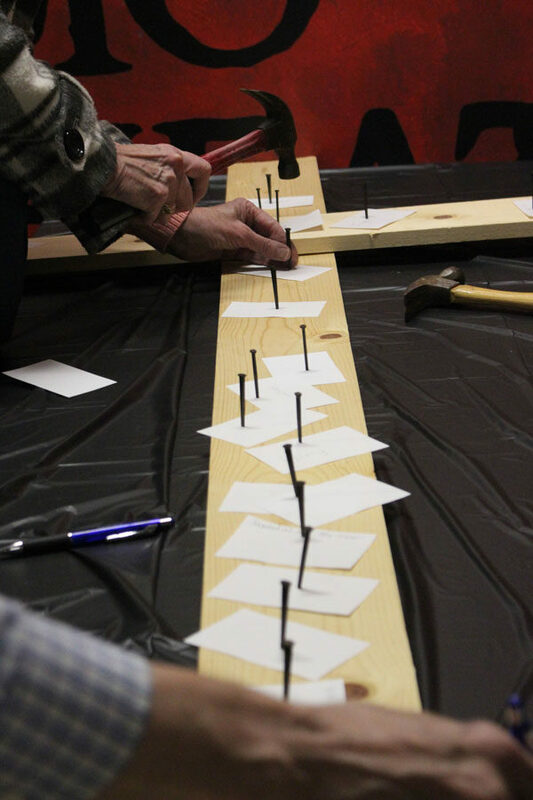 A heartbeat in the dark commemorated the final pulses of hope in the world on that cross. The main theme was the determination of Jesus to finish the work of the cross through his death. 6:30 pm: Totally Accomplished. Celebrating the wonderful final words of Jesus on the cross, “It is finished!” Our freedom from sin was accomplished with that holy sacrifice of the Perfect Lamb! This service was special for the lighted atmosphere, two pieces of special music, and many visitors to the church. We asked Dr. John Noble, from Huntington University, to provide us a Hebrew reading of Isaiah 52:13 – 53:12. We played the recording and then had a responsive reading by Craig and Becky Kupferberg. It was amazing to hear and experience what Jesus might have heard in the synagogue! Easter Sunday continued the theme with two services: Totally Alive (Sunrise) and Totally Accepted (Christ welcoming the disciples on the beach in Galilee with breakfast). 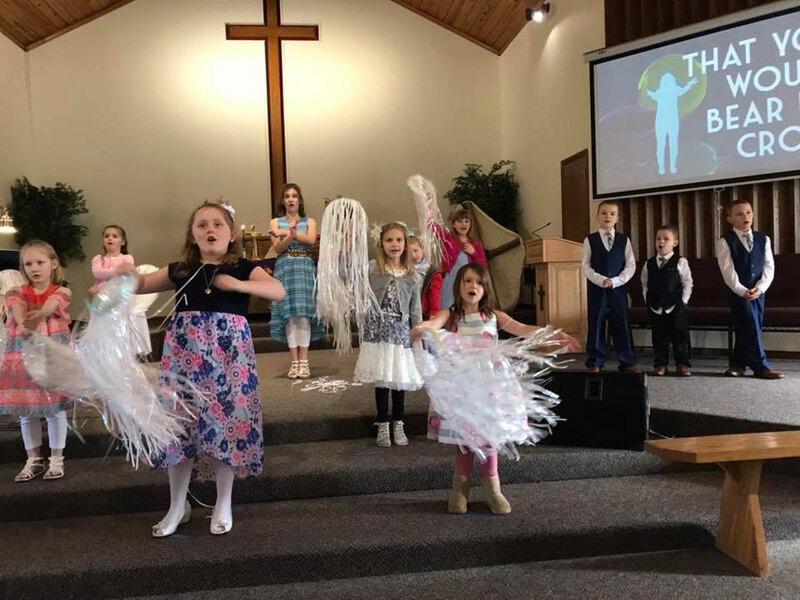 The children celebrated with a special presentation, the worship team shared a meaningful piece, and others found different ways to bring the new life in Jesus into focus. On March 31, Kilpatrick Church sponsored our first Easter Eggs-travaganza. We are endeavoring to reach our “Jerusalem” (Woodland, Mich.). It was a cold (30s), rainy, windy (gusts 30+ mph) kind of a day. Typical Michigan. 157 children were registered, along with 35 adults. Around 250 people showed up. Our volunteers were troopers as they set up refreshments, registration, and then distributed 5400 eggs for the children of our community. Six bicycles and two tricycles were given away via drawing, and 40 prize eggs were in the mix. Fourteen families indicated they wanted more information about Kilpatrick Church. 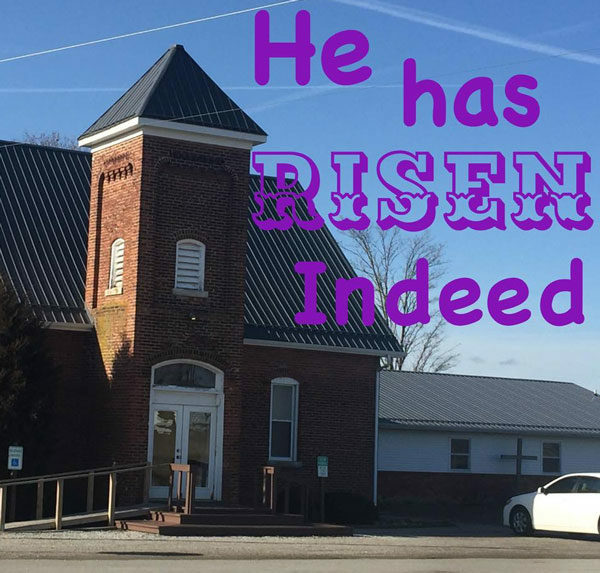 Easter Sunday was well attended, with our largest number on record. The best part: three individuals chose to make Jesus Christ their Savior. The United Brethren Association’s Annual Ministry Leadership Resource Day is coming up. The deadline for registering is April 13. UB Pastor Mike Dean will unpack II Corinthians 10:3-5. What is a “stronghold”? What does it mean to “take captive every thought and make it obedient to Christ”? Learn Scriptural principles for healing, wrong thinking, and damaged emotions. Anyone in any leadership position at your church is invited to attend. Please help us to spread the word! There is no cost to attend the seminar. Fees associated with lunch and Sunday night lodging are on the brochure. Download and mail in your registration form, or register here. At the Good Friday service. The worship team leading music at the joint Good Friday service. Josh Kesler, pastor of The Well in Huntington, Ind., preaching at The Well on Easter Sunday. 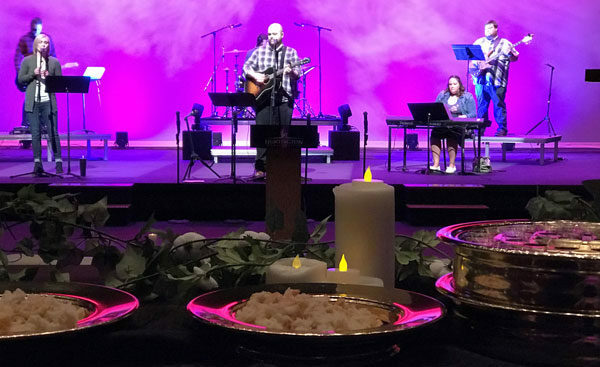 Four United Brethren churches in Huntington, Ind., and surrounding areas held a joint Good Friday service on March 30 at Huntington University. Churches represented were College Park, Dillman, New Hope, and The Well. New Hope hosted a Stations of the Cross before the service. Matt Kennedy, pastor of Dillman, delivered the message. It was a great group effort and meaningful night. 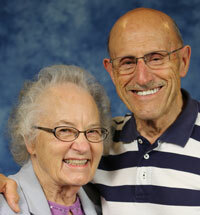 Mary Ann Goldsmith, 86, wife of UB minister Rev. Wayne Goldsmith, passed away on March 31, 2018. She was a pastor’s wife for 66 years. Viewing: 5-8pm Wednesday, April 4, 2018. Viewing location: D.O. McComb & Sons Maplewood Park Funeral Home, 4017 Maplecrest Rd., Fort Wayne, Ind. Funeral: 3pm Thursday, April 5, 2018. Funeral location: Central Church, 5801 Schwartz Rd, Ft Wayne, Ind. Read the online funeral notice.